Image from KCBS Los Angeles broadcast. 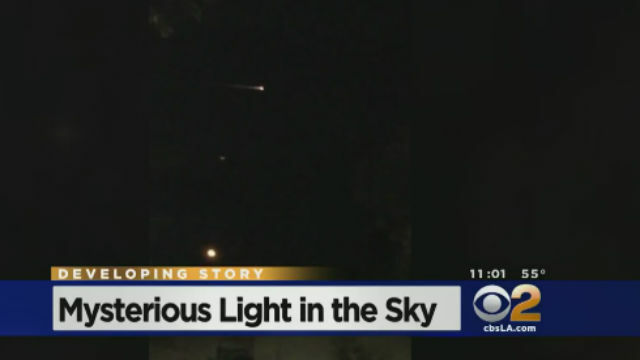 A fireball streaked through the Southern California sky Tuesday night, prompting hundreds of social media posts and plenty of speculation. The streak was reported and captured on video by observers from Arizona, Nevada and California. The director of the Griffith Observatory, Edwin C. Krupp, was prepping for interviews with broadcast reporters even as some commentators posted jokes about a second launch of a SpaceX rocket, which managed a vertical landing in Florida last night. Others wondered earlier on Twitter whether the streak of light was from a missile. Krupp told reporters that it was either a meteor or debris falling from space and burning in much the same way that a meteor would burn when it enters the earth’s orbit, according to an observatory spokesman. The website CalSKY, which bills itself as “the most complete astronomical observation and information online-calculator on this globe,” reported that a SL-4 rocket body “either landed, decayed or docked” at 6:16 p.m.